Make your bed. Yes, it’s a hassle. Which is why the Europeans, who have been hassled with making the bed for centuries longer than we have, rely on the duvet cover. This is essentially a big pillow case that slips over a comforter, does away with multiple layers of sheeting, blankets, etc. and allows you to spread the bed very quickly and easily. Besides, “duvet” sounds better than saying “bed spread” doesn’t it? While thread count is important, the kind of cotton from which the bed linens are made has a lot to do with how well they will wear and how comfortable they will be. A longer thread like Egyptian cotton in a 300-400 thread count is, in my opinion, your best bet combining durability and luxury. The architect shared this little bit of housekeeping shortcut with me: wash your duvet cover and hang it to dry over a balustrade so that the weight of the water as it drips to the bottom of the duvet pulls the wrinkles out as it dries. Presto! Instantly “ironed” without the expense. Toby Worthington once wrote in to say that one may also iron while the sheets are on the bed. Not sure I would try this if the duvet were to contain your comforter, but you might lay it out on the bed to iron it if you can’t hang it to dry. This entry was posted in Living and tagged basics, Living. Bookmark the permalink. 5 Responses to Et tu, duvet? Great tip about hanging it over a balustrade to dry. Toby has a great idea too! An aside: remember when Euro pillows used to be called “Continental Squares”? Are Americans the only ones to call them Euros? And do they still call them Continental Squares on the Continent? 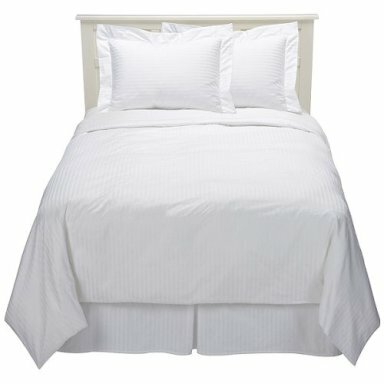 Ever since my husband and I went to Europe for a mini “Grand Tour” in 2001, he’s been talking about the duvets. He especially liked our hotel room in Salzburg, where the bed was a queen size but it had two twin duvets, instead of one big one. Peak, wouldn’t they just call them “pillows?” All of mine fell by the wayside years ago. Now the only issue I have is that standard pillow cases that won’t fit the orthopædic things we use. Duvet covers are perfect when you have a dog who likes to nap on your bed. love duvets, especially freshly laundered with meyers verbena soap.